How can one top a magical, dream season? New England Patriots quarterback Tom Brady has been asked that question quite a few times in his career. Somehow the legendary signal caller has been able to continually one-up himself. The 2018 race season was a remarkable year for the NHRA Mickey Thompson Top Fuel Harley class and its come-from-behind champion Tii Tharpe. The 42-year-old, Spevco-backed nitro guru from Pfafftwon, N.C. won his first NHRA title in dramatic fashion. A race promotion simply can’t ask for a more exciting finish than for a class championship to come down to the final run of the final race. As was the case in Pro Stock Motorcycle, where Matt Smith and Eddie Krawiec decided the championship in the Pomona final, Tharpe and rival Doug Vancil fought for the Top Fuel Harley championship at the category’s final race of the year, the illustrious U.S. Nationals from Indianapolis. Tharpe’s spectacular charge to the championship was made even more impressive by his unintentional absence from the season-opening race in Pomona. Tharpe’s team, Jay Turner Racing, suffered an accident on the way to the event when their trailer came detached from the towing rig. Jay Turner and team encountered this hardship while traveling to the Winternationals. Thankfully no one was injured but it was enough to sideline two of the category’s toughest and most respected competitors. After the returning, Vance & Hines-backed Vancil scored a victory in his debut and looked as strong as ever, it was hard to imagine Tharpe or Turner being able to make up the deficit. Except for Tharpe. He thrived in the underdog role and the pressure seemed to shift to team Vancil to maintain the lead. Tharpe would go on to become the most consistent rider on tour for the balance of the season. It all culminated in Indianapolis at Lucas Oil Raceway. Tharpe entered the final race trailing by 11 points and it would take him every possible round of racing left in the season to get the lead. Through it all Tharpe never lost confidence in himself. After nervously pacing back and forth and watching the a few of the competitors in front of him struggle in the left lane, Tharpe made a last second lane swap in the opening round. The decision paid off with a first round win over Chris Smith. “To be that far back in the points and come back at the final race was really special,” Tharpe said. Tharpe’s road to the top of one of dragbike racing’s most prestigious and popular categories has been a long one. The talented veteran has paid his dues and honed his skills, competing in Pro Mod, Pro Drag and Pro Fuel before turning to Top Fuel in 2003. The veteran understands the importance of constantly improving in drag racing. There wasn’t much time off to celebrate. Tharpe’s team has had a busy and vigorous off-season. Like Brady hitting the gym or throwing passes after a Super Bowl victory, it’s what needs to be done to top a magical season. Tharpe will retire his championship-winning “Maddy.” Some are surprised Tharpe will put away the championship-winning machine, that featured a chassis provided to him by AHDRA legend Mike Lehman, named after Lehman’s daughter Maddy. As special as the bike is to Tharpe, he knows evolution and progression is what is needed. Tharpe is thankful for the upgrade in stopping power Largertha and Maddy Too will have as he, along with many other nitro Harley racers, consider Pomona a short shutdown track. Tharpe’s teammate Mike Scott found that out the hard way last season when he ended up in the sandpit. Although the NHRA season was finished Tharpe and Turner found some testing opportunities close to home with AMRA and Man Cup. Tharpe admits it took him a little while to get used to Lagertha during his first opportunity to test at the AMRA race in Rockingham last October. By the time Tharpe got to the Man Cup Finals at South Georgia Motorsports Park in Valdosta, Ga in mid November he appeared more than comfortable on the beast. It took the second quickest Nitro Harley run of all-time, a spectacular 6.06 by Takeshi Shigematsu on his supercharged bike to put Tharpe on the trailer. Tharpe made several impressive passes during the long weekend. Tharpe is optimistic Lagertha and the unfamiliar yet upgraded Maddy Too will lead him to a career best elapsed-time and speed, surpassing his impressive 6.16 at 232 mph. Tharpe knows it’s what he will need to stay out in front as he expects the ever-improving and growing field to be as tough as ever, including his nemesis Vancil. Even amongst Tharpe’s own team the competition will be fierce. Jay Turner Racing will bring four, maybe five, bikes to Pomona with Scott, Randall Andras and possibly Lyle Newton assuming riding duties with Tharpe and Turner. 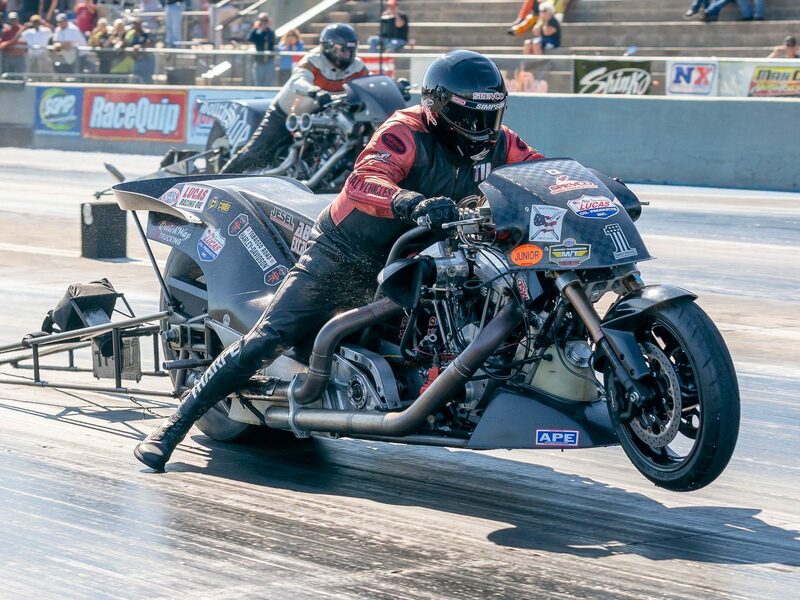 Tharpe thinks NHRA made the right decision letting the supercharged bikes race in the class and isn’t buying the argument that the lack of consistency could hurt the racing. Tharpe says if Turner finds success on the supercharged bike, his new motorcycle will easily accept the Procharger. Tharpe says if all goes well the upgrade to a supercharger could take place as soon as Gainesville. If the supercharger proves to be the way to go serval competitors could make the switch during the season. The new year of nitro burning comes with a lot of unanswered questions and intrigue, but one thing is for certain; it’s sure to be an exciting season. “We can’t wait to get to California. It’s freezing cold at home and it’s time to go racing,” Tharpe said. Welcome to sunny Pomona. Welcome to the 2019 race season.